Services at the bus station in Umag It the bus terminal building, you can obviously find a bus ticket office and a waiting room where also luggage storage is available. In the other part of the terminal, there is a coffee bar, an exchange office as well as a Mercator supermarket. Taxi can usually be found on the front side of the building. 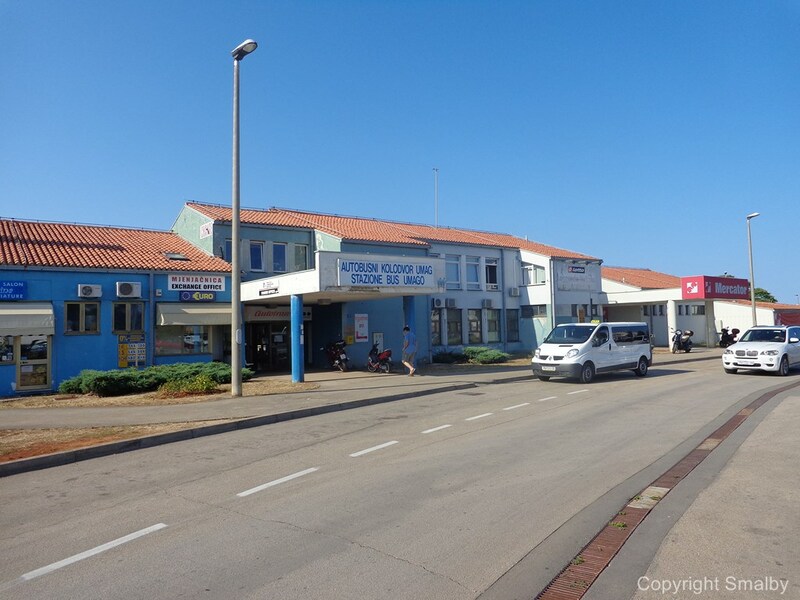 Accommodation by the bus station in Umag As mentioned above, the bus station is situated at the outskirts of the town, which means there are not many accommodation options in the neighbourhood of the bus station. The best option in walk distance is the town centre where you can find mainly hostels and apartments. Day trips with bus from Umag From Umag you can easily arrange a day trip by bus to the following cities: Triste, Novigrad, Rovinj, Pula, Porec, Motovun and Groznjan. If you wish to visit popular destinations like Venice, Plitvice lakes or the Postojna cave in Slovenia, you will have to join an organized excursion from a local travel agency. A list of possible excursions and daytrips from Umag you can find here. Most popular routes from Umag From Umag there is a fair amount of daily bus connections to the major Istrian cities and also to Trieste in Italy. Also to larger cities like Rijeka and Zagreb there are several daily departures. If you have to travel to destinations further away like e.g. Split, you have more connection options if you travel via Rijeka. Click on the routes in this table to see timetable and travel information for the most popular bus routes from Umag.